Take a step-up by taking a step back with this Golden Era-inspired acoustic gem. 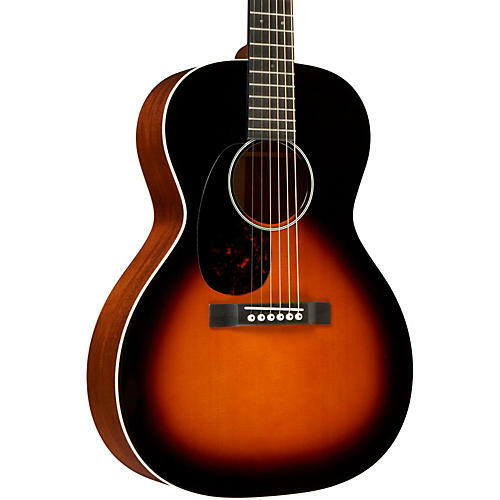 Designed by Chris Martin, the CEO-7 Left-Handed Grand Concert Acoustic Guitar is a "00" slope shouldered short scale reminiscent of models from the "Golden Era", with a gorgeous Autumn Sunset Burst finish, Golden Age Relic Nickel 2517 tuners with cream plastic buttons, and authentic headplate lettering. Providing you with a nice booming sound is a solid Adirondack spruce top and solid ebony fretboard complimented by solid genuine mahogany back and sides for complex tonality. Other accoutrements of the CEO-7 Left-Handed Grand Concert Acoustic Guitar include a striaghtline bridge with drop-in saddle, bone nut, dovetail neck joint, X-scalloped bracing, a modified V neck, and Old Style 18 positioning inlays, grained ivoroid heelcap, and a Delmar tortoise color pickguard. Comes with a 5434 Geib style case. Seven is a lucky number. Go all in with this guitar and you'll feel and sound like a winner. Order today!